"Organic" - whilst it may just seem like a fashionable buzz-word right now, the reality is there's nothing new or fad about naturally grown produce. In my opinion it's organic produce that should be considered 'normal', not it's factory farmed, agro-chemical competitor. The trouble is, organic produce is expensive! I know many of you don't like the idea of burdening your healthy bodies with the toxins of herbicides and pesticides of commercially grown foods, but the cost of that organic shop is equally as unappealing! Well folks - here's a little insight that will help you know where to save your pennies and where your organic splurges are well-informed. 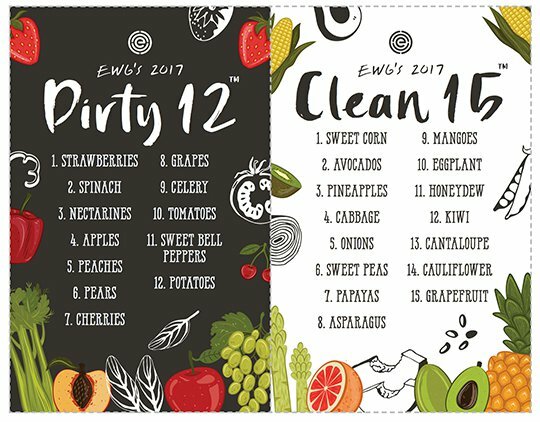 I introduce to you the 'dirty dozen' and 'clean fifteen'. These are lists of fruits and vegetables that retain the highest and lowest residues of the chemicals used in their growing. These chemicals are, by their very nature, toxic. But by following these lists you can cleverly guide your precious funds towards the healthy, organic splurges that make the most sense! A big thanks to EWG for these pretty infographics! I hope you find them interesting, useful and as a result enjoy being a well-informed, occasional organic-ista!